DOI : 10.23893/1307-2080.APS.05703 Solid dispersions have been proved to be an effective method for the improvement of solubility and bioavailability of poorly water-soluble drugs. The study was designed to demonstrate the potential of ketoprofen loaded BSA solid dispersions on the solubility & in-vitro release of ketoprofen. Ketoprofen-BSA solid dispersions were prepared by the freeze-drying method. A 2-factor, 3-level central composite experimental design was used to study the effect of varying concentration of BSA and ketoprofen on drug solubility & in-vitro drug release. 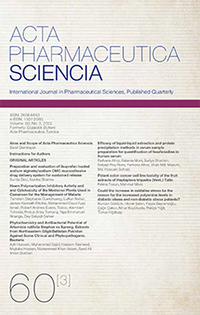 The combined effect of concentration of BSA & ketoprofen on % release and solubility exhibited a linear relationship between independent and dependent variables, suggesting that higher level of BSA & ketoprofen favours the expedited release and solubility.